Each student gets an alien taped to his back. They then walk around the classroom and ask each other how much of each body part they have. 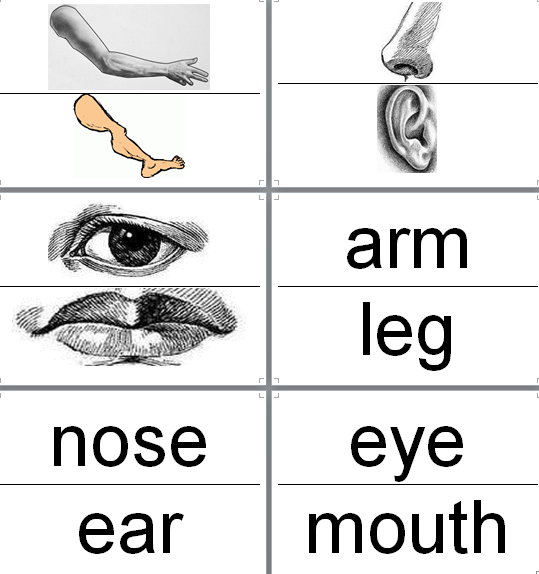 This activity teaches the vocabulary "legs, eyes, mouths, noses, arms, and ears." It also uses numbers 1-4, and the phrase "how many ~ do I have?" Before class print up enough aliens so that you have one for each student. There are six types of aliens; make sure you don't have too many of a single kind. You will be taping these aliens to the students backs, so in order to save time in class, get something like a hard palette, and tear off and attach a large number of pieces of tape to it. This way you can pull them off quickly instead of wasting time mucking around with the tape dispenser. If your students don't know the words for the body parts that will be used, be sure to drill them on the vocab before beginning the activity. When you begin the activity, hand out the worksheet, and explain to the students that you will tape an alien on each of their backs. Each alien is different. Some have 2 eyes, and some have 3; some have 2 legs, and some have 4. They want to know how many legs, eyes, mouths, noses, arms and ears their alien has. They must do this by finding a partner and asking "how many (body part)s do I have?" The other student then answers accordingly. They should record the answer on their worksheet. Demonstrate how to do the activity once with the JTE. 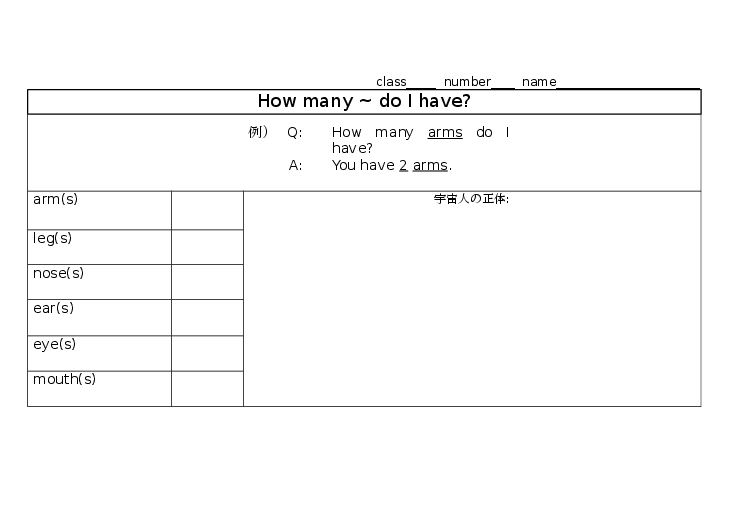 Drill the dialog a few times to make sure the students can ask each other "how many (body part)s do I have." Have the students line up one row at a time, and come to the front of the class to have an alien taped to their backs. Be sure they do not see their own aliens. Some students may exclaim that it is gross having an alien on their backs, and pull it off. Encourage them to be grown up about it, and leave it on. When all the students have aliens on their backs, have them stand up and wander around the room asking about their aliens. Police them, making sure they don't cheat and use Japanese. This should take maybe 10 minutes. Once they know how many body parts their alien has, have them sit down and draw a picture of their alien on the worksheet. This isn't necessarily educational, but elementary, and even junior high school first year students enjoy it. Have the students remove the aliens from their backs and compare them to the answers they got from their friends. Make sure students don't cheat and use Japanese. Make sure students don't peek at their own aliens. Make sure students don't take their aliens off because "it's gross" or because they are overly excited about what their alien might look like. The plurals "mouths" and "noses" are a bit difficult. Make sure to practice them before starting the activity.